Your vehicle inspection doesn’t have to be a hassle. At Honest-1 Auto Care, we make it easy to complete your state-mandated vehicle inspection. Offering convenient hours and efficient service, Honest-1 Auto Care in Mooresville, NC takes the headache out of state vehicle inspections. 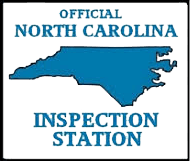 We are the experts in North Carolina State Vehicle Inspection. State-mandated inspections are a necessary but inconvenient part of life for any vehicle owner. Your vehicle inspection doesn’t have to ruin your day. Because you can trust us to thoroughly and efficiently inspect your vehicle according to state requirements while providing you with the friendly, professional service you deserve. We understand that your time is valuable. That’s why we do everything we can to get you back on the road quickly–with no stress and no hassle. If it’s time for your state-mandated vehicle inspection, Honest-1 Auto Care has you covered. Contact us today for information about our hours, documentation requirements and inspection services.